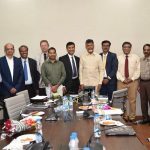 Dr Ravi Khetarpal, Executive Secretary, was received by Minister of Andhra Pradesh Sri N Chandra Babu Naidu, who agreed to become a member of APAARI. Dr Ravi is a member of the work plan committee of the Mega Seed Park venture of the Andhra Pradesh government. The meeting was held in Vijayawada, Andhra Pradesh on 20-21 June 2018.